A man armed with a knife who breached a restraining order by approaching his ex-girlfriend in the street has been jailed. Daniel Shenton, 24, of School Hill Cottages, Stratford Road, Wootton Wawen, had pleaded guilty to breaching the restraining order imposed by Leamington magistrates in February last year banning him from having any contact with her. 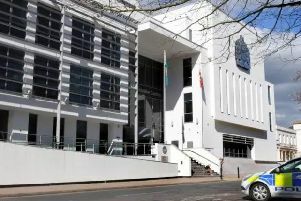 He denied possessing a bladed article when he breached the order by approaching her in the street in Stratford town centre seven months later. But a jury at Warwick Crown Court took just an hour and 26 minutes to find him guilty. He was jailed for eight months, with a concurrent four-month sentence for breaching the restraining order. Prosecutor Scott Coughtrie said that on September 27 last year Shenton’s ex was out in Stratford town centre with a friend. The relationship between them had ended in November the previous year, and ‘due to the nature of the break-up’ magistrates had imposed a restraining order on Shenton banning him from seeing her for 12 months. At about 11.30 that night the two friends decided to leave the Wetherspoons bar they were in. They saw Shenton but decided to ignore him. Shenton’s ex and her friend left later to go back to their respective homes, but as they were walking through the town centre they noticed Shenton walking behind them with a knife in his hand. She told him to go away, but he ignored her and began to make disparaging comments about her friend. She decided to call the police, at which stage Shenton left. The police arrived and found him sitting at his car outside The Stratford hotel in Arden Street. Mr Coughtrie added: “His bag was recovered and searched, and in it were chef’s whites and a box of kitchen knives, because he is a chef by trade. Shenton said he recalled seeing his ex at about 9.30 as he was returning from work. He accepted he spoke to them, but denied making any derogatory remarks and denied producing a knife, claiming his knives had remained in his bag at all times. But his assertion was unanimously rejected by the jury. Jailing Shenton, Recorder Kevin Hegarty QC said there could be no alternative to an immediate custodial sentence for having a knife in a public place. He also imposed a new five-year restraining order on him.